We are all familiar with Balsamic Vinegar these days but most of us only with the industrial type, this being a copy of the original. If it comes in a half litre bottle or does not make you gasp at the price, it will almost certainly be the copy. The original dates back to Roman times, back then refined sugar wasn't around, even when it did arrive in the 1400s it was dreadfully expensive. Anyone with a sweet tooth had pretty much two choices, honey or reduced grape juice. To make the latter, white grapes were allowed to mature, maximising the sugar content. They were then pressed and the juice boiled for many hours, reducing its volume to a half or third of the original. The result was sweet and syrupy, easy to keep being too concentrated for yeasts to ferment and great for putting in your cooking. However grapes only get harvested in the autumn, so the syrup had to be stored, often in wooden barrels, for use during the rest of the year. At some point someone must have left a barrel of the stuff, forgotten in a store room for many years and going back to it found it now contained a thick dark, bitter-sweet liquid, the first, primitive Balsamic vinegar. By the middle ages the process had become very complex. Rather than one barrel there were now five, sometimes even seven, these were of diminishing volumes and different woods: chestnut, acacia, cherry, oak, ash and juniper. All are filled with the reduced grape juice and left in an attic. To get the best results very cold winters and very hot summers are needed, Modena in Emilia Romagna, northern Italy has just this climate. During the summer some of the liquid evaporates and some disappears as gasses due to a type of bacteriological fermentation. In the winter, when the vinegar is dormant, the smallest of the barrels is topped up from the next biggest, this in turn is filled by its bigger brother and so on until the biggest is filled with produce from the autumn's harvest. This goes on for a minimum of twelve years, after which about half of the contents of the smallest barrel is bottled and the topping up process repeated. From now on a small amount can be taken every year. The only way to be sure of the best quality Balsamic is to buy that supplied by members of one of the two "Consorzio"s, bodies that control and guarantee authenticity. Labelled either Aceto Balsamico Tradizionale di Modena or Aceto Balsamico Tradizionale di Reggio Emilia, ("Tradizionale" is the important word), these are sold as twelve, twenty-five, fifty and one hundred years old depending upon when the ageing process was started. There are various producers making excellent Balsamics who are not members of a Consorzio, either because their vines are grown outside of the accepted area, or simply because they want to go their own way. Some have made interesting varieties using barrels of only one wood such as cherry or juniper, these produce their own distinctive flavour. However it is difficult to tell just from the label how good the contents will be. 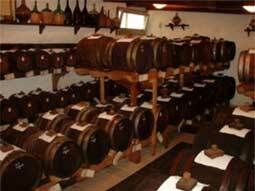 Next in line for quality are Balsamic vinegars which start life as an industrial product. These are then blended with the real thing, often spending a few years in oak barrels. 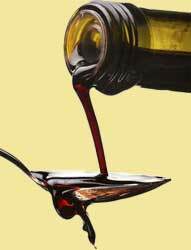 The least expensive and easiest to find, start life as a red wine vinegar, added to this is caramelized sugar, flavourings, colourings, and quite often a thickener such as corn flour. The annual production of all the members of the "Consorzio Aceto Balsamico Tradizionale di Modena" is less than that produced in a day by a medium sized industrial factory. The oldest traditional Balsamic vinegar is the most treacly, so it sticks nicely to fruit, ice cream and cold savouries. It's absolutely delicious dropped onto shards of parmesan cheese. The younger traditional Balsamic vinegars have more fragrance and are also a bit more vinegary, so best used with cooked veggies, on steak or even a boiled egg . . . your salivary glands go crazy even before the food reaches your mouth. Neither of the traditional varieties should be cooked. The industrial version of Balsamic vinegar is fine for braising meat and in most cooking recipes. Putting a few drops of the real stuff into the mass produced version, will also make an enormous difference to your salad. This balsamic vinegar article was provided by Jonathan Arthur who runs Italy with Relish cooking and villa holidays in the Tuscany region of Italy.